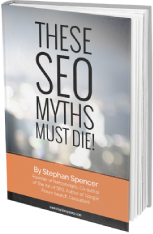 Learn the number one misconception about SEO that could cause you to lose everything. We have had hundreds of presenters at our events over the years and Stephan is always one of the top most well-received. He brings top-notch expertise and real world examples that really resonate. I wouldn’t hesitate to put him into one of my lineups. I don’t know about you, but A. I know it’s important, B. I know I don’t know very much about it. What I do know though is that Stephan Spencer is the smartest cat I know in the world about SEO. I know because he does it every day for himself and his clients. So if you need SEO help, you should probably check him out. For the better part of a decade, I have been talking about understands social media with Stephan and he is one between SEO of the few people related who really understands the blend between SEO and social media, and how it’s related to commerce, specifically ecommerce. In terms of ROI, it was a sizable investment for us at the time but absolutely worth every penny. He gave us a roadmap that we were working on for years after that engagement ended and again it was complete. So in summary, I recommend Stephan Spencer wholeheartedly. He’s certainly a thought leader in the industry and that was evident every moment that he worked with us.